A big thanks to Tim Sweeney for hosting Justin and Eamon on Beats in Space last night. You can stream their mix via the soundcloud embed above and check out the tracklist over on Tim’s site here. Enter Mario. This incredible gentleman has been flying solo to our parties for years now, embarking on the nearly two hour drive from Monroe, NY simply to enjoy the party. It was our honor to finally sit down with Mario and find out a bit more about this sweet man, whose quiet dedication has meant so, so much to us. Give him a firm handshake and a big smile if you see him at another party. MSN: So how did you hear about Mister Sunday? Mario: About three years ago, I was listening to Tim Sweeney’s radio show Beats In Space [on 89.1 WNYU radio] – I still listen to him – and they were giving away tickets to a Mister Sunday party. So I called up, I won the ticket, and I showed up, and I said “Wow, this is awesome!” It’s like being at a friend’s barbeque on a Sunday afternoon, but there’s like 300 people! It’s unbelievable; it’s really nice. MSN: And ever since then you started coming to more Sunday parties, and then to the Saturday night parties? Mario: Yeah, then I started coming to that, uh, 172 Classon location? Mario: Right, OK. So I was going up the stairs over there, and Justin was coming down, and he goes, “Excuse me, I’ve seen you a couple of times at our parties.” And I said, “Yeah, you’re the DJ! 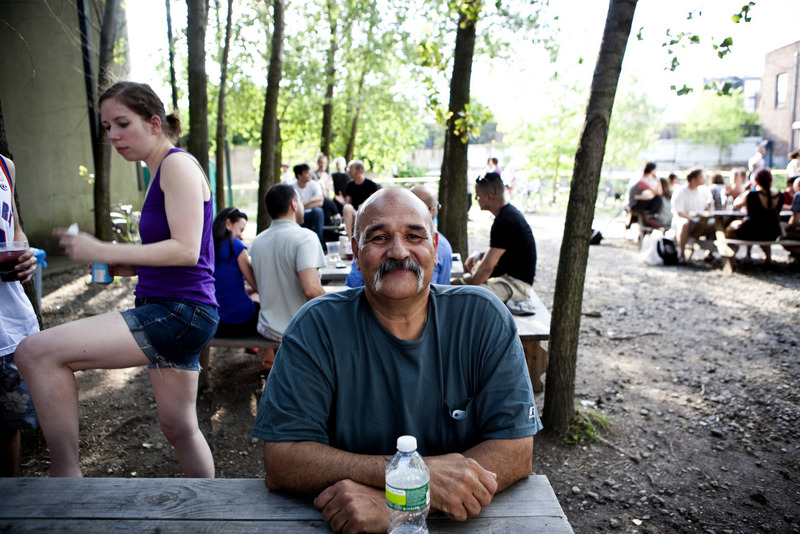 My name’s Mario.” So we started talking, and he told me it was nice to see me, and he didn’t believe how old I was! I was 59 back then, now I’m 62. MSN: Wow! Well, age is just a number. Mario: Yeah, it’s all a mental state. So I’ve been coming ever since. Justin once in a while puts me on the guest list, which is great. MSN: So you listened to Beats In Space, but were you into any other parties, shows or radio programs at the time? MSN: Oh, those guys are great! A Downtown Affair? Mario: Man, they’re awesome! So I started hanging out at their parties. They play some really awesome music – and they have great guests, like Justin and Eamon. MSN: So did you grow up in NY? Mario: Yeah, up in the Bronx. MSN: Did you ever go to any parties back in the day? Mario: Oh yeah, well, back in the day, in my teenage years, I was into Latin and rock & roll. I used to go to the Bitter End Café down in the village, the Fillmore East – the Garden used to have great parties. MSN: What kind of artists did you like to see? Mario: Oh, The Grateful Dead, James Taylor, The Allman Brothers Band. And I was into Latin music, too, like Tito Puente, Ray Barretto, [Johnny] Pacheco, Santana, War. I like music in general. Once in a while I’ll listen to South American Andes music, which is all flute music, which is awesome. I’ll also listen to classical music. Once in a while I’ll get into this classical thing, and I listen to Bach or Chopin, people like that. I just like music. Mario: Long Live Music, man! [laughs] That’s it, you know? Without music, I don’t think there could be communication. Look at all the different peoples you have here, which is the great thing about this. I’ll tell you a quick one. Mario: I was at my nephew’s daughter’s Baptism. I was in the bathroom, and I heard this strange music coming from one of the other rooms. So I stood outside, and they were playing Turkish music – they were Turks, having a wedding, and the music was AWESOME. So I’m standing there, grooving to the music, and this old man comes outside, taps me on the shoulder, and says “Come in, come in!” And he dragged me in, man! So I met his daughter, his son – I’m like, holy smokes. Music is a language unto itself. If you can understand music, you can understand people. And that’s about it.